How Low-Power Can You Go? [lasersaber] has a passion: low-power motors. In a bid to challenge himself and inspired by betavoltaic cells, he has 3D printed and built a small nuclear powered motor! This photovoltaic battery uses fragile glass vials of tritium extracted from keychains and a small section of a solar panel to absorb the light, generating power. After experimenting with numerous designs, [lasersaber] went with a 3D printed pyramid that houses six coils and three magnets, encapsulated in a glass cloche and accompanied by a suitably ominous green glow. Can you guess how much power and current are coursing through this thing? Guess again. Lower. Lower. Finally, A Calculator For The Atomic Age! In the 1950s, a nuclear-powered future seemed a certainty. The public had not been made aware of the dangers posed by radioactive material, any large-scale accidents involving nuclear reactors had either been hushed up or were yet to happen, and industry and governments were anxious to provide good PR to further their aims. Our parents and grandparents were thus promised a future involving free energy from nuclear reactors in all sorts of everyday situations. With the benefit of hindsight, we of course know how the story turned out. Windscale, Three Mile Island, Chernobyl, and Fukushima, and we’re still waiting for our atomic automobiles. If you have a hankering for nuclear-powered domestic appliances though, all is not lost. [GH] is leading the charge towards a future of atomic energy, with a nuclear-powered calculator. It’s not quite what was promised in the ’50s, but it is nevertheless a genuine appliance for the Atomic Age. At its heart is not a 1950s-style fission reactor though, but a tritium tube. Beta particles from the tritium’s decay excite a phosphor coating on the tube’s inside wall, producing a small amount of light. This light is harvested with a solar cell, and the resulting electrical energy is stored in an electrolytic capacitor. The cell has an open-circuit voltage of 1.8 V, and the 100 μF capacitor in question stores a relatively tiny 162 μJ. From this source, a dollar store calculator can operate for about 30 sec, so there should be no hanging about with your mathematics. We’ve brought you a tritium battery before, albeit a slightly larger one. And should you need the comforting glow of a tritium tube but not the radiation risk, how about this LED-based substitute? A commercial nuclear battery from City Labs. A Betavoltaic cell is a device that uses a radioactive source of beta particles and a semiconductor p-n junction to generate electricity. 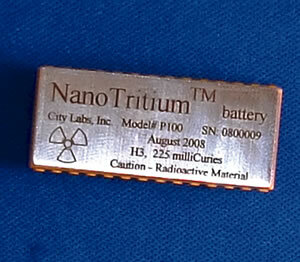 Tritium, an isotope of hydrogen, is often used as the radioactive element. You may think that tritium is hard to obtain or even forbidden, however, recently you can find tritium in self-lightning key chains, and it is also used in watches and firearm night sights. The beta particles (electrons) from the tritium radioactive process causes phosphors in the device to glow, giving a light that can last for years. [NurdRage] has just created a nuclear battery using tritium vials from key chains. After getting rid of the plastic containers, he sandwiches the vials between two small solar panels. That’s all! Instant power for the next 15 years. Of course, the amount of power you can get from this device is on the order of microwatts. The battery produces around 1.6 volts at 800 nano amps. He gets 1.23 microwatts, not much, but it is in fact more than the output of commercial units at 0.84 microwatts, for a ten percent of the cost. That minuscule amount of power is actually not easy to measure, and he does a great job explaining the circuit he used to measure the current. Tritium, or 3H is an isotope of hydrogen which has been used as everything from radiolabel in analytical chemistry to a booster to kickstart the chain reaction of nuclear weapons. Lately tritium’s most common use has been in key chains and jewelry. A small amount of tritium is stored in a phosphor coated glass tube. The beta decay of the tritium causes the phosphor to glow. The entire device is called a Gaseous Tritium Light Source (GTLS). In the USA, GTLS devices are only allowed to be used in specific cases such as watches, compasses, and gun sights (MURICA!). Key chains and jewelry are considered frivolous uses and are prohibited by the nuclear regulatory commission. Of course, you can still order them from overseas websites. The safety of GLTS devices have been hotly debated on the internet for years. They’re generally safe, unless you break the glass. That said, we’re happy getting our radiation exposure through cool hacks, rather than carrying a low-level source around in our pockets. Enter [Ted Yapo], an amateur astronomer. After tripping over his telescope tripod one time too many, he decided to take matters into his own hands. He’s designing TritiLED, a dim LED light source which can last for years. [Ted] is using a Luxeon Z LED, driven with PWM by a PIC 12F508 8 bit microcontroller. Running at 26.3 μA, he estimates about a year of run time on a CR2032 watch battery, or a whopping 15 years on a pair of lithium AA cells. Sure he could have done it with a 555 timer, but using a micro means more features are just a few lines of code away. [Ted] took advantage of this by adding a high brightness mode, blink modes, and an exponential decay mode, which emulates the decay of GLTSs. Best of all it’s all open source. [Ted] is publishing under the (CC-BY-SA) license on Hackaday.io. Here’s a hypothesis for you: radioactive decay varies over time, possibly with a yearly cycle. [Panteltje] decided to test this hypothesis, and so far has two year’s worth of data to comb over. Radioactive decay can be easily detected with a photomultiplier tube, but these tubes are sensitive to magnetic fields and cosmic rays that would easily fly through just about any shielding [Pantelje] could come up with. Instead, the radiation in this setup is detected with simple photo detectors, pressed right up against a tritium-filled glass ampoule, a somewhat common lighting solution for fishing lures, watch faces, and compasses. The experimental setup records the photo detectors, a temperature sensor, and a voltage reference, recording all the data to an EEPROM once an hour. All the important electronics are stuffed into a heatsinked, insulated, light-proof box, while the control electronics reside on a larger board with battery backup, alarm, indicator LEDs, and an RS232 connection. After one year, [Pantelje] recorded the data and reset the experiment for another year. There are now two years worth of data available, ready for anyone to analyze. Of course, evidence that radioactive decay changes over the course of a few years would turn just about every scientific discipline on its head, so at the very least [Panteltje] has a great record of the output of tritium lights against the expected half-life.